Blog | Page 3 of 3 | How to learn Hungarian? The Hungarian movie is famous for a reason. Hungarian actors, directors, producers have made it to Hollywood a couple of times by now. Just think about Bela Lugosi, Zsa Zsa Gabor, Andrew Vajna, and the list could go on. 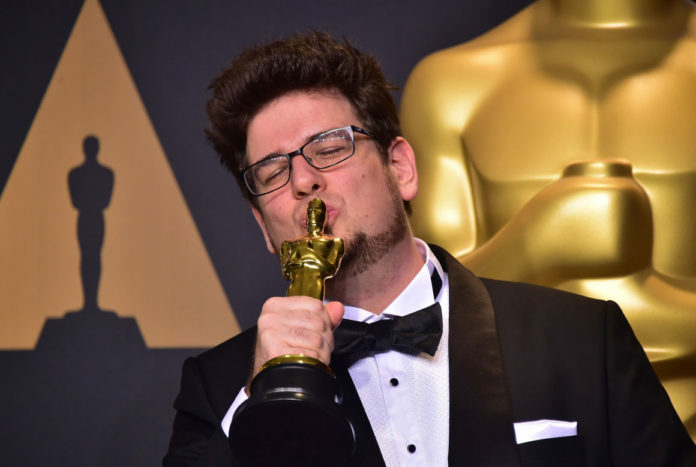 Today morning’s sensational news was that the Hungarian short film “Sing” (Hungarian title “Mindenki” meaning “everyone”) by Kristóf Deák has won an Academy Award in the category of Live Action Shorts. This is the highest ranking award in the movie industry. The story of the movie is about a children’s choir, and the child-actors who performed in it held a waiting-for-the-Oscar slumber party at their school in Budapest. Watch how they celebrate when the winner is announced. It’s pure joy, the classroom is radiating emotion. I guess you are curious about the movie these kids are acting in. You can watch it below. Did you find this article interesting? Let other people know about it, please, share it with your friends! What if you don’t have the time, determination or possibility to become fluent in Hungarian? I have good news: speaking broken Hungarian is way better than speaking no Hungarian at all. It can make all the difference even if you only know a couple of words. After all it all comes down to being brave enough to communicate with limited vocabulary. Csak kicsit beszélek magyarul. I only speak a little Hungarian. Beszélek egy kicsit magyarul. I speak a little Hungarian. The key difference lies in your attitude. In saying the first sentence you emphasize the fact that your Hungarian knowledge is weak. It’s almost as if you apologized because you didn’t study enough (and you should have). In the second sentence you emphasize the fact that you do know some Hungarian. You are proud of yourself, because you made an effort and learned some Hungarian expressions (even though you shouldn’t have). So if you want to practice your Hungarian, and don’t want the Hungarian speaker to switch to English, I recommend using the second sentence. By the way, if you get out of your comfort zone and leave the bubble that the multinational company environment represents, you will discover that the real Hungary starts where the English-speaker world ends. You will make good use of this sentence, I promise. Az én nevem Lili. Amerikai vagyok. Téged hogy hívnak? Az én nevem Lili. Amerikai vagyok. Önt hogy hívják? I don't understand this. Help me, please! Nem értem ezt. Segíts, légy szíves! Nem értem ezt. Segítsen, legyen szíves! If you are in a situation that you must speak with somebody, but that person only speaks Hungarian you will notice that meta-communication works just fine. By meta-communication I mean activity-style showing. You can use your hands, your smile, and those few words of Hungarian you already know. Once I saw a foreigner buy a variety of fruits at the market. He could only say “kiló” in Hungarian, the short form of kilogramme. He’d show a number with his finger, say “kiló”, show at the pile of fruits he wanted to buy, and smile. At the end both customer and salesman were smiling. A friendly face and a few words can make a miracle, indeed. If you enjoyed this article, please, share it with your friends. You can do it below! The days of the week in Hungarian are one of the first things a language learner has to memorize. You will surely use them when visiting Hungary: at a hotel reservation, arranging a trip to Lake Balaton, checking when the shop is open, renting a car, visiting a doctor, etc. Petra: “- What day is it today, Kriszti? I forgot. Unlike English, the Hungarian language adopted the tradition of taking Monday as the first day of the week (the same goes with Slavic, Baltic and Uralic languages). 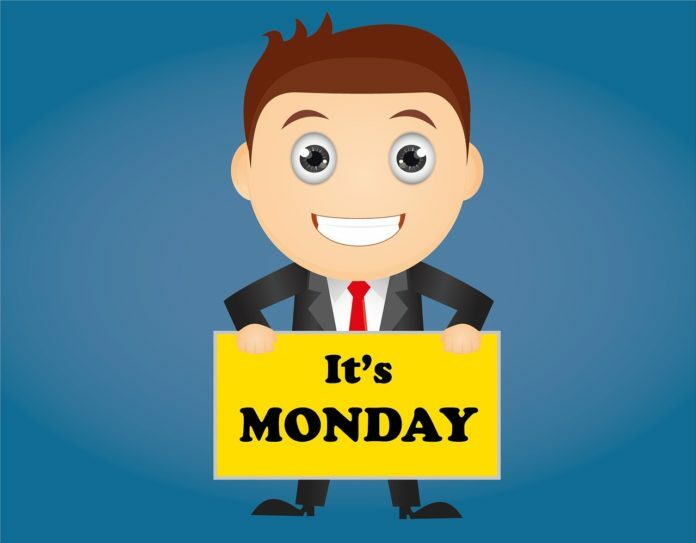 Hétfő, the word for Monday literally means the head of the week. It marks the beginning of the week. Kedd, the word for Tuesday meant the second day, it comes from a shortened form of kettő–kettedik, meaning two-second. Szerda comes from a Slavic form of sreda meaning middle. After borrowing the word from Slavic, Hungarians changed it to szerda, because pronouncing two consonants at the beginning of a word sounds foreign, unnatural. Csütörtök also comes from the Slavic, originally it meant the fourth. Péntek also has Slavic origin, originally it meant the fifth day. Szombat comes from the Hebrew sebbath (meaning day for resting), and has been taken over from old Church Slavonic sobot. Vasárnap means market day. Markets were being held at this day in the old days. Let’s see some examples of using the days of the week in real-life sentences in Hungarian. -n -on -en -ön as an ending. Kati hétfőn jön látogatóba. Cathy comes to visit on Monday. Laci kedden megy a kórházba. Laci goes to the hospital on Tuesday. Petra szerdán vizsgázik. Petra has an exam on Wednesday. Csütörtökön kezdődik az iskola. School starts on Thursday. Pénteken sok munkám lesz. 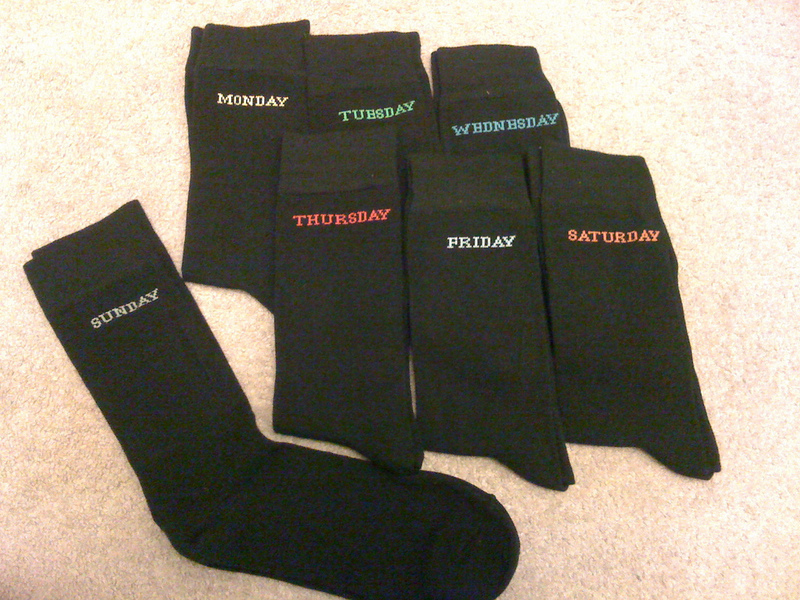 I will have a lot of work to do on Friday. Julcsi szombaton moziba megy. Julcsi goes to the movies on Saturday. Vasárnap itthon maradunk. We stay home on Sunday. You can notice that each day got one of these endings: -n , -on, -en, -ön. How can you know which endings match to each word? There is a rule that determines suffix usage in Hungarian, it is called the vowel harmony. The vowel a at the end of szerda has turned into its long form á: szerda – szerdán. “Vasárnap” is the only day that didn’t get any ending, this is an exception. Now you know the words of the week in Hungarian, you can even say a few simple sentences. 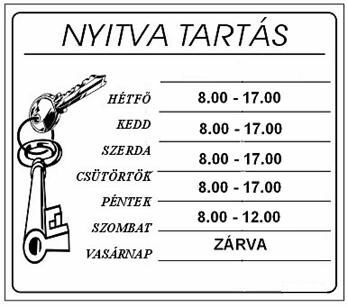 You can read the opening hours of the stores, by the way it is called nyitvatartás in Hungarian. You can always check when your favorite shop is open in Hungary. Have a good time! Is it really that hard to learn Hungarian? If you search for the most difficult languages to learn, Hungarian comes up in top 10, along with Arabic, Japanese, Navajo and Mandarin. So why did Hungarian get this bad reputation? Hungarians call themselves and the language they speak “magyar”. Hungarian/magyar is like an island on the sea of Indo-European languages. It is surrounded by great nations and languages with a lot of speakers like Slavic, German and Latin-based languages. If you think about learning a foreign language, your first choice would obviously be one of these, because they are so evident. Hungarian doesn’t resemble any language you usually come in contact with, it is totally different in terms of grammar or vocabulary. Is Hungarian the hardest language to learn? The farther your mother-tongue is from a language you want to learn, the harder it will get, because you will not have any familiar patterns to lean on. “Magyar” is an agglutinative language just like old Sumerian. As opposed to English, it expresses relations of the words in a sentence by adding suffixes to the end of each word (think of English prefixes like “at”, or “on”, or “in”; suffixes are the same stuff, just they come at the end of words). In English, this relation is expressed by word order. This agglutinative way gives great freedom to Hungarian speakers to emphasize different things in a sentence by changing the word order. This leads to a complex case-system; Hungarian has got 18 cases (according to some linguists it has only got 3). Odamegy az asztalhoz. – He goes to the table. Odamegy a székhez. – He goes to a chair. Odamegy a sütőhöz. – He goes to the oven. Hungarian language divides the vowels according to the place where they are formed in the speaker’s mouth. One can differentiate between front and back vowels, and wovels created with rounded lips and unrounded lips. Hungarian speakers don’t mix vowels in a word, they keep it all front or back ones, so you have to attach the suffix that respects the vowel-harmony in that word. Sometimes you even have to decide whether it is created with rounded lips or not, so that complicates the issue even more. The good news is that although this rule looks complicated, in fact it is simple. It seems complicated, because there is no such thing in English. If you listen to a lot of Hungarian, you will instinctively feel which suffix goes to a certain word. It comes from the rhythm of the language, and there is logic in it. Wovel-harmony is also used by Korean, Mongolean, Turkish languages. Now, that I’ve spoken about the hardest parts of Hungarian grammar, let’s see, why it is easy. It hasn’t got grammatical gender. There is nothing like “der, die, das” in German or “il, la” in Italian. You don’t have to learn how to say “the” for every word in the language. You can forget complex verb tense systems. Hungarian is easy, because each Hungarian verb has only 3 tenses: past, present and future. No present perfect, past perfect or future perfect that European languages usually have. Easy, isn’t it? It is a phonetic language, meaning that you pronounce each syllable clearly. You don’t have to worry and guess what syllable is being omitted by a native speaker. If you learn the sounds and letters (you can do that in an afternoon), then you can read any Hungarian word you like, and you can pronounce them properly. Accent always falls to the first syllable. No complicated accent and stress patterns, you don’t have to remember where to place the accent for each word. He speaks Hungarian quite well, doesn’t he? It is a language that can be learned, if you want to. Imagine how awesome would it be to say: I speak Hungarian. You can do it, if you want to. So, you decided you want to learn Hungarian. 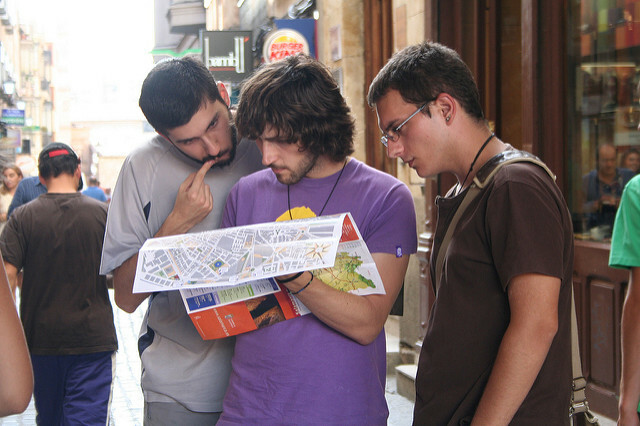 What comes to your mind when you think about language learning? Is it the school? Long French, Spanish, or other language lessons you had to attend when you were a child? Word lists that had to be memorized? Words describing grammar that you know you learned in school, but you don’t quite remember them? Agonizingly boring declinations? 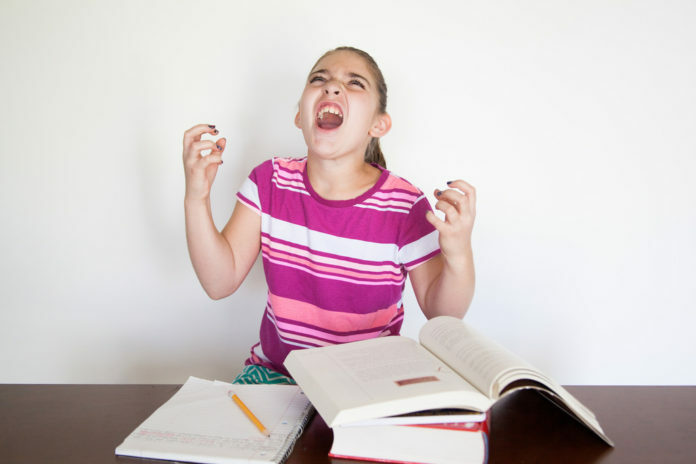 The feeling that you are learning, learning and learning, but you don’t get anywhere? Let me tell you the good news: it doesn’t have to be this way. Hungarian learning can be fun, and it can be fast. You don’t have to study Hungarian for 10 years to be able to speak it. Think about the way children learn. Usually, children can speak their mother tongue by the age of three. Why can they do this in such a short amount of time? The key is in the input. They are constantly surrounded by their mother tongue, and there is a person (their mother), who explains them everything, all the time. If you attend language lessons twice a week, that means 2X52=104 hours of Hungarian learning in a year. If you learn 2 more hours at home too, that means an additional 104 hours. If you keep this pace, you will have 208 hours of input each year. That isn’t enough to learn Hungarian. A child gets that amount of input in a month. How many hours of learning does a person need in order to achieve fluency? According to “The Foreign Service Institute (FSI)”, it will take 1100 hours for an English speaker to reach a “General Professional Proficiency” in Hungarian. You can do the maths. Belief is essential in succeeding in anything you do, and it is especially important for language learning. Believe in yourself, believe that you can achieve fluency in Hungarian if you want to. Is it really possible? Sure it is, many people have already done it. Benny Lewis, the Irish polyglot could speak better Hungarian after spending just 2 months learning it, than many foreigners, who have been living in Budapest for 10 years. So, what can you do to learn as quick as Benny? The answer lies in increasing the amount of Hungarian input. The best way of doing so in traveling to Hungary and being surrounded by Hungarian all the time. In Hungary you will be forced to learn Hungarian, even if language learning is not your main focus. If this is not possible for you for various reasons (you’ve got a life to live at home, I know), the next best thing you can do is emulating a Hungarian environment around you. Well, I don’t mean trying to fool native Hungarians, that wouldn’t make sense. What I am trying to say is that you should close your eyes for a minute and play like you were playing in your childhood. What would you do if you were Hungarian? You would start the day by listening to a Hungarian radio station. In the morning, when you get up, and eat your breakfast, get ready for school or work, tune in to a Hungarian radio station. Don’t mind if you can’t understand anything in the beginning. You will eventually absorb the sounds and rhythm of the Hungarian language subconsciously. During your day, read Hungarian news on the Internet. The major news portals that Hungarians usually read are Index and Origo. You can get some more news portals here. Don’t back off if you are just a beginner, and you don’t understand anything. There is a Google Chrome plugin made just for you! It is called Mind The Word, and it has been specially developed for language learning. It makes easy for you to learn new Hungarian vocabulary while surfing the Internet. Change the language on your phone and computer to Hungarian. First, it may seem annoying that you can’t find anything, but gradually, you will learn plenty of new things. Do whatever you like doing, but in Hungarian. Do you like watching movies or TV series? Watch them dubbed in Hungarian, with English subtitles. You can find some Hungarian DVDs on eBay, and this store ships Hungarian DVDs anywhere in the world. Watching Hungarian TV is also a way of having fun while learning. You can watch some Hungarian stations for free here. Play video games (if you like them) in Hungarian. When you can already say 5 sentences about a topic in Hungarian, go for searching language exchange partners. You can find native Hungarian people willing to talk to you for free if you talk to them in your mother tongue. Easy, isn’t it? You can accelerate the language learning process by bringing more target-language input in your life. You can do this several ways, without having to leave the place you live in. You can do it even if you feel like you don’t have time for anything. You don’t have to take away time from any of your usual activities, you just integrate Hungarian into your life. It is worth it, your progress in Hungarian will get a huge boost. Do you want to know more about effective language learning? I found some amazing infographics that can accelerate learning any language. What makes a good Hungarian-English Dictionary? All language learners need a good dictionary every now and then. But wait a second: how do we define the term “good dictionary”? How good is an English-Hungarian dictionary supposed to be? How can you differentiate between real gold and “fool’s gold”? First of all, a good dictionary is easy to use. You can find the words, expressions that you are looking for quickly, and you can easily distinguish among several words meaning the same thing. You can do this because the dictionary offers the Hungarian words according to the frequency of usage, from most common to least common. This makes possible for the language learners to choose the most popular form of the word without anybody helping them. Secondly, a good dictionary has lots of examples of Hungarian word-usage, and a large vocabulary. If you don’t get to feel the meaning of the new word at once, looking at these examples are a good way to clarify it. Thirdly, it helps the language-learner with the right pronunciation of new words. It can help you by offering a phonetic transcription of each word using the International Phonetic Alphabet (IPA), or giving you an audio pronunciation of the Hungarian word. The best dictionaries offer you both. This is my personal favorite. It is a true community-based dictionary, which means that community-users edit its entries. + It is a two-way dictionary, it has an English-Hungarian and a Hungarian-English part as well. + You can listen to the pronunciation of the words. – Unfortunately the Hungarian audio uses text-to-speech software, so it isn’t native pronunciation, and the intonation is weird sometimes. + You can register and contribute to the dictionary entries. + You can learn Hungarian idioms, proverbs, collocations. This is an online translator-dictionary hybrid. + You can use it to translate a single word, and more sentences as well. + It recognizes a lot of English phrases and idioms. – Unfortunately it doesn’t have Hungarian pronounciation of words (though it does have English). + The translation is good for a lot of idioms. + It has Hungarian audio pronunciation for the words. – Unfortunately the Hungarian audio uses text-to-speech software, so it isn’t native pronunciation. I don’t recommend to use it for learning pronounciation. – Only the English words have phonetic transcriptions, the Hungarian ones don’t. It has a clear, user-friendly search-bar without any other texts, pictures that can draw your attention away from what you are looking for. + Its interface isn’t as crowded as the other dictionaries’. + You can choose whether you want an exact match of the word, or an approximate. – It doesn’t help you with the pronunciation at all, no phonetic transcript, no audio. – When the “exact match” field is ticked, it doesn’t find idioms. This dictionary is made by a company that produces e-book readers and translation software. – Crowded interface, many advertisements. + Besides of translating a word into Hungarian, it also classifies it as a part of speech. – It doesn’t offer any help with the pronounciation. – It didn’t recognize the idiom “over my dead body” (I was using this idiom as a test, all the other dictionaries could translate it right). A new arrival on palette of Hungarian-English dictionaries, it has just appeared. + Blab-la is a name worth being remembered when speaking about language-learning products. 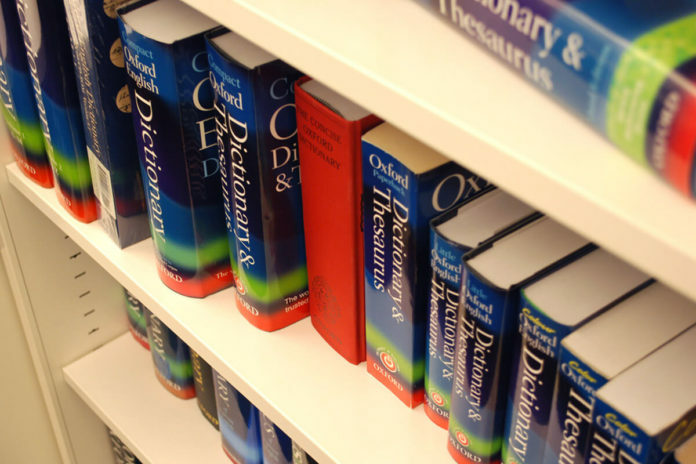 Dictionaries by Blab.la are usually good quality. + Just like Sztaki, it also uses a community made of language-learners and native speakers to improve the dictionary entries. You can register and become part of this community. – It also uses text-to-speech, but it is one of the best. You can use it for learning pronunciation. + It gives several meanings of an English word in Hungarian. Beside the Hungarian meaning it is always given, what part of speech that is. It also has example sentences, with audio pronunciation. To sum it up, there isn’t such thing as a perfect, free, online English-Hungarian dictionary. However there are dictionaries that are near perfect. If you are learning Hungarian, I recommend using the Sztaki English-Hungarian dictionary, and the Blab.la dictionary. Both dictionaries cover wide Hungarian vocabulary, come with sample sentences, audio pronunciations, and related words. They both are under constant revision by a linguist community. If you would like to hear a Hungarian word pronounced by native audio speakers, I recommend using Forvo. Just type any Hungarian word into the search bar, and listen to various pronunciations uploaded by native speakers. 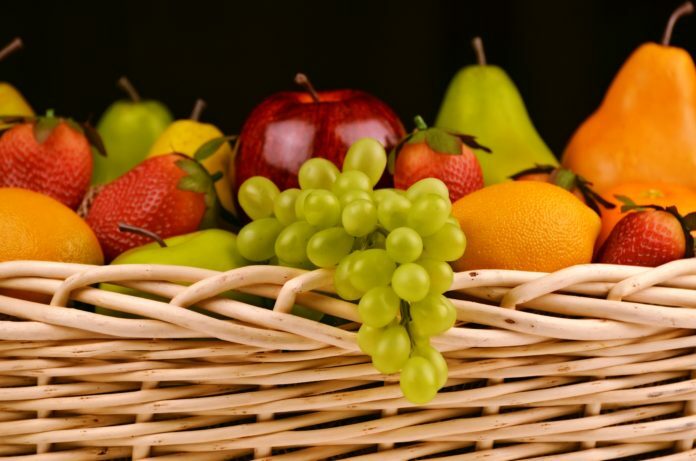 Let’s learn about the names of fruits in Hungarian! We can buy almost anything on the market today. Exotic fruits and vegetables are available all-year-round. If you go to a Hungarian market, you probably wonder, what fruits are truly Hungarian, and which are the imported ones. I hope this picture helps you sort out what you want to buy next time. Below the picture you will find the names of the fruits pronounced. If you found this post about Basic Hungarian Vocabulary interesting or useful, let others know about it, share it with your friends. Why on earth should I learn Hungarian? Well, there are different answers to this simple question. People are not the same, and a lot of times your friends’ answer won’t be satisfying enough for you. Every person has to find his/her own quests and challenges. You know, the thing that is so interesting for you, that it keeps you going. It gives you the flow experience. For some people it is fishing (even if you have to wake up early in the morning and stay quiet all day long), for some it is gardening (even if it involves getting dirty), for some it’s scuba-diving (the danger), and for some it is discovering new cultures and languages. My new hobby: learning Hungarian! I hope that you are in the last group, and you feel naturally inclined towards learning a new language. If you don’t, if you can’t find any internal motivation for learning, just let it go. External reasons (you are not interested at all, but you need to know the language because of your job, or studies) will not be enough. 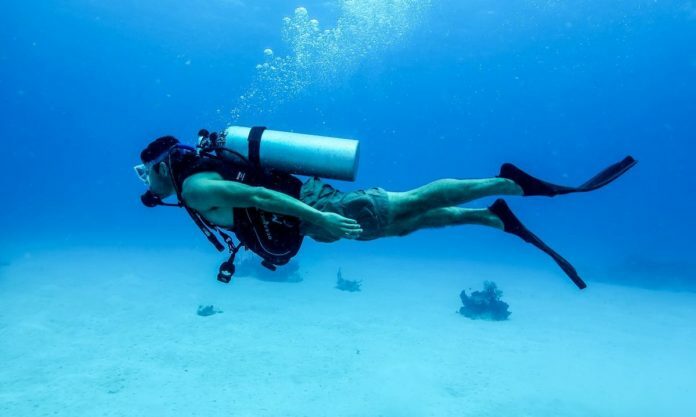 Do yourself a favor, and go scuba-diving, or do something you really want to. You can study that, and you can make a living out of that, too. You will be happier, I can assure you. How awesome would it be if I spoke Hungarian? How many new friends could I make? I could speak with my extended family back in Hungary. I am intrigued by the Hungarian culture. I could go to places no tourist ever gets to, and be understood. It is said to be one of the hardest languages to learn – it is a real challenge. It is interesting to learn a language that has a different logic than English. I am currently in Hungary, but not everybody speaks English. Do you have similar thoughts? Great! Let me show you something: I have just found this video and I think I must share it with you. These two students think learning Hungarian is the most exciting thing in the world. And because they are feeling this way, it became a truly appealing activity for them. Owen, who is from Ireland says he wanted to learn an Eastern-European language so he asked for his linguistics professor’s help. He immediately advised him to learn Hungarian because it’s so far away from any other language in Europe, and it is a language of the poets. Owen thinks Hungarian sounds good because of the vowel-harmony. “Literature and poetry in Hungarian just seem to flow.” – says Sul, from London. Have Owen and Sul convinced you that Hungarian is a language worth learning? What are you waiting for, start learning right now! You can find many resources on this website. I just love the famous Hungarian hit song “Most múlik pontosan”, performed by Csík Zenekar. The song was originally performed by Quimby, but I like the Csík Zenekar’s version more. It has traditional Hungarian folk themes that capture the essence of the Hungarian soul: the gift of being able to revel while crying. The song is bitter-sweet, it captures your heart and soul. True catharsis at the end. You can read the Hungarian lyrics and the English translation here. The Hungarian alphabet, or in Hungarian, “magyar ábécé”, consists of 40 letters. If you didn’t get intimidated by the large number of sounds and letters, let me tell you that there is also an extended version of the Hungarian alphabet that consists of 44 letters. This extended version includes the letters Q, W, X, Y – that are not usually used in Hungarian, except for foreign words and traditionally written family names. The Hungarian alphabet is derived from the Latin one, however, it uses different accent marks on the vowels, double and triple letters on some consonants. It may sound complicated, but for the language learners’ luck, Hungarian is mostly a phonetic language. This means that Hungarian words are usually written just as they are spelled. This means that pronunciation and spelling is much easier to learn than with English, for example. 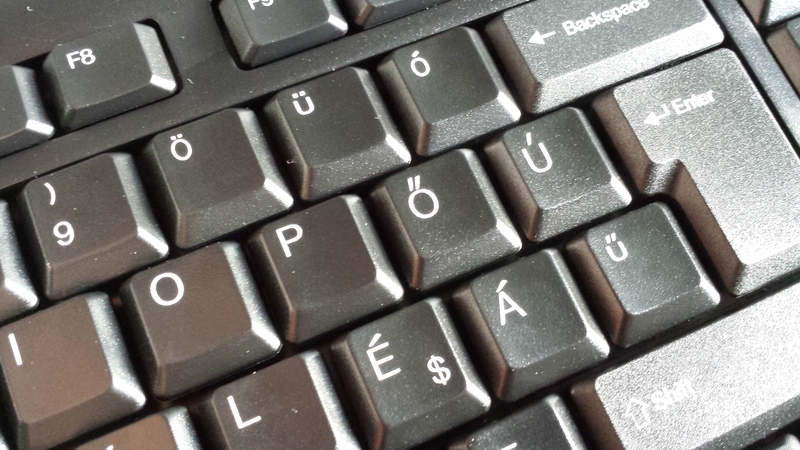 Hungarian writing may be simple once you learned the proper pronunciation of a word. Mindenki tudja, mégis megkérdezi, hogy van az ábécé? Ty, az egy nagy tyúk. Vége is van a dalnak, ez az ábécé!